Grade beam is normally constructed on neck column and It connects two or more column together. In another word, grade beam carries the load from ground floor slab and transfer to column. Grade beam is normally constructed on ground. Purpose of this post is not to define what the grade beam is. I just giving some idea about grade beam so that newbie can understand the grade beam well. The purpose of this post is to show you how to estimate the concrete volume of grade beam. For estimating the concrete volume for grade beam you’ll need following structural drawing sheets. Grade Beam Layout: This sheet of structural drawing shows how to place grade beam on column. 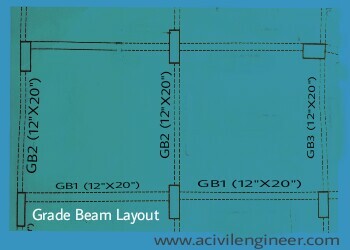 In the above image, the grade beam layout just shows the grade beam number (GB1, GB2, etc.). It also shows the cross-sectional dimension that is 12″ x 20″. So you don’t need to look out for cross-sectional dimension of grade beam. You’ll get it from here. Column Layout: The grade beam layout we have in the above image doesn’t show the length of beam. If you want to calculate concrete volume of grade beam you’ll need it. So you’ll need to go to column layout for the length of beam. The above image is a column layout sheet of structural drawing. To get the grade beam length you have to calculate the distance between columns. I told before that you’ll also need the cross-sectional dimension of column for calculating concrete volume of grade beam. See the above image you’ll get this from there. Such as C1 (15″ x 45″), C2 (20″ x 45″), C3 (20″ x 35″), etc. So you don’t need any further cross-sectional dimension sheet for column. Are you still here? Then let’s estimate the concrete volume for grade beam. We’ll estimate concrete volume for GB1 shown in the 1st image. 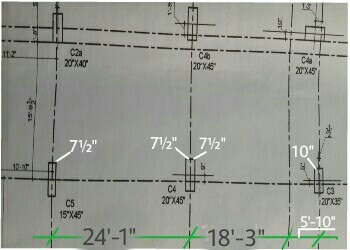 Length of grade beam shows nowhere in grade beam layout sheet (1st image). sometimes it’s shown on the reinforcement detailing layout sheet of grade beam in structural drawing. 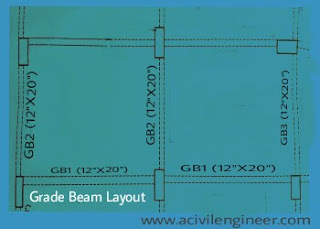 You can also calculate the length of grade beam from column layout drawing sheet (2nd image). For finding the length of grade beam (GB1) you have to find the distance between C1 and C2 as well as the distance between C2and C3. For finding distance between column C1 and C2 you have to find the gap between grid-1 and grid-2. Then you have to deduct column portion inside the grid-lines. Let’s do this. Gap between grid line 1 and 2 is 24′-1″. Wait, we are not finished yet. To get the concrete volume of grade beam you also have to estimate the concrete volume for column head. Column head is the portion of column which intersect with beam. In the 2nd image you’ll find three column heads connecting by the grade beam (GB1). So you have to estimate the concrete volume for these column heads also. The height of all three column heads are same as height of the grade beam. That is 20″. = 26.39 cft (cubic feet). Following this process you can estimate the concrete for all grade beams of your project. If you want to cast the grade beams manually by mixture machine then you have to calculate required concrete ingredients for the volume of concrete. Read the following post to know how to calculate concrete ingredients. Do you have any better idea for estimating concrete volume of grade beam? Please share in comment below. I am a new contractor and have been assigned to design grade beams for a new project that my company is working on. I enjoyed the simplicity of these photos. I also have heard that making small models out of clay with smaller proportions can also be a help. I will be using these for help!